Gold Fish Casino Review 2019 – Get 5 Million coins! Gold Fish Casino may not have millions of likes but it has the games that can impress all Australian players, while adding more than enough coins to play for days. Gold Fish Casino hosts its exciting games on a nice background where the players can see fish happily swimming in the water. Of course, the first game matches this theme. The social casino really doesn’t waste any of your time. After starting from Facebook, players are presented with the lobby and the available games. The background scene is nicely set to show that the action takes place underwater and the first slots game available is called Gold Fish. As a result, the theme is more attractive than the classic casino environment seen on most other sites so we liked the effort put in as we jump into the Goldfish Casino review. Established in 2014, the casino already has more than half a million likes on Facebook and it continues to grow in popularity rather quickly. It is operated by SG Interactive, one of the largest brands when it comes to online casino games for free. The great part is that it owns major software developers for casinos, such as Bally and WMS, and so it has a selection of games on the social casino that will definitely appeal to Aussies. What stands out is that there is only one game available at the first level, along with a featured title. However, it is very easy to increase the level and thus unlock more games. As we browsed the list, we found quite a few pokies that are sure to make customers eager to increase the account level. For those who are already convinced and want to join right now, we have the links available for easy access throughout the social casino review. Also, joining with your Facebook account will land you 5,000,000 coins for free just to help things get going. There are a few other bonuses available instantly while more are made available on a regular basis. The casino really is all about playing online slots for free but it still maintains the option for clients to buy large sums of coins with real money. All of this and more can be accessed directly from your smartphone device or tablet. Gold Fish Mobile provides free applications designed to bring the pokies to your fingertips, no matter where you are. You can find them on the online store for the device as the software covers iOS, Kindle and Android. Secure connections are guaranteed across all applications and sharing details with Facebook friends is not imposed. Easily one of the biggest welcome bonuses seen at a top social casino is the offer made out of five million coins that each new user can get when signing in for the first time on Gold Fish Casino Slots. This makes it simple to go for the maximum bets available and this in turn will affect the rate at which the level increases. It also gives a wide variety of options for setting the wager with no worries whatsoever. The green button in the bottom right corner will offer a bonus every two hours. Claim five of them in a row to get an even bigger bonus as a special reward for being a frequent player. The money is only added to the balance when clicking on the bonus and claiming it. Gifts can be sent among friends at Goldfish Casino and players can easily send invites from the app. There is a dedicated button for viewing the gifts available and for sending some to others. The level can be increased by filling the bar on top. This is done by just playing the games since all wagers and triggered game features will contribute to it. Once the bar is full, the next level is reached. Rewards are offered for certain stages and one game is unlocked every three levels. In addition to the normal level up system, players will also collect Rubies from winning spins. Filling the Ruby bar will unlock Ruby Slots. Two games are selected randomly and they will be available for playing for a whole hour. These pokies are usually chosen from the best titles that the casino has to offer. Gold Fish Casino Slots keeps the promotions coming week after week. A quick glance on the community page on Facebook will show that there are various offers designed to celebrate big events. Players can take part in the promos to get rewards, deals and more. Play at Gold Fish Casino with your 5,000,000 coins Now! Aussies will definitely have some nice games to play for free at Gold Fish Casino. The only problem is that they have to be unlocked. When first joining, there is one slots game available in the lobby and another title that is currently featured for free. Once you place a couple of bets and get some winnings spins, there will be two more Ruby Slots selected from the list that can be played for an hour. Games are normally unlocked at a rate of one slot for every three levels. The casino app focuses all of its efforts on providing free online pokies so it doesn’t have other casino games, like roulette, baccarat and blackjack. However, with the awesome looking graphics and the immersive themes, it is very easy to have fun for long sessions with this collection of games. Some of the options have special features added by the casino and they are displayed on top with big letters for Shell Drop and Buried Treasure. Selected slots will share the different progressive jackpots that can be worth billions of coins. 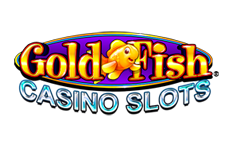 More than 40 free mobile slots are available when playing from a smartphone or tablet at Gold Fish Casino. The operator makes it easy to connect and it even gives an extra 1 million coins for free on the first install. In order to get going, you will have to download the proper application. Gold Fish Casino Slots can be found on iTunes for Apple devices like iPhone and iPad. When it comes to android smartphones, the free app on the Google Play Store can be installed in a couple of minutes. If you prefer using a Kindle device, SG Interactive has an app for the casino on Amazon. The pokies will look just as good on your phone as they do on a computer. With HD graphics and fast loading times, it is easy to get lost in the exciting world created with the help of authentic slot machines found in Las Vegas casinos. The features will remain the same so the added functions and progressive jackpots can still generate large wins, even if you are on the move. Crossplay: Yes. Use the same account to play on a computer and on mobile devices. Goldfish Casino Slots doesn’t promote real online gambling. All of the games are meant to be played for fun with the available coins. To make sure that players are not restricted to the bonuses offered, there is the option to buy coins using real cash. This is done through the apps so the actual banking methods accepted are mostly limited to debit and credit cards from MasterCard and Visa. US players can also use American Express and Discover Cards on Facebook. It is possible to make secure payments from the mobile applications as well, which will be processed by the store systems. The social casino does not currently accept Australian Dollars. Everything is done in US Dollars on the online store so payments from other currencies are converted automatically. For the actual Facebook casino app, English is the only language option. This is not the case when it comes to the official Gold Fish Casino Slots website since there is a translator from Google available that covers many options. If there are any issues, Australian players can always contact the support team by sending a message. The option is available in the settings menu so it is very easy to use. Comments on the Facebook page with questions and concerns are also answered fairly quickly. A large slots help centre can be accessed for more information regarding the software, the platform and other topics. There are many great things about the social casino that we will quickly sum up to offer a nice picture of what to expect when playing here. The Gold Fish Casino review presents the software and the games as the main attractions and this is certainly true given the awesome collection of free pokies that can be found here. Although not many are unlocked, the levels grow at a fast pace thanks to the large betting limits so new slots will be available within minutes. The playing free aspect is helped by the large bonuses. Not only do new players get five million coins but there is a bonus of 100,000 coins that be claimed every two hours along with gifts from friends, special promotions, rewards, events and more. Aussies that enjoy betting on tablets and smartphones will be happy to see the different apps provided for accessing more than 40 games from anywhere. In conclusion, Goldfish Casino Slots is up there with the best of them.